I thought I would give some insight into some upcoming projects. It’s really an accountability factor if I throw out into the world my plans. It pretty much forces me to not procrastinate. I’m a stickler for follow through when I make a commitment and have years of deadline anxiety embedded in my DNA. Project(s) #1 – this will be a ongoing, long-term series of projects. Why? Because I have committed to using up my HUGE pile of supplies in my quest of downsizing and simplifying. This will not just be drawings and paintings. I have piles of yarn, scraps of fabric, inks, markers, specialty paper, antique books, junk drawers, etc. There are a couple of baby blankets planned, glass/mosaic projects and some mixed media artwork on the horizon. 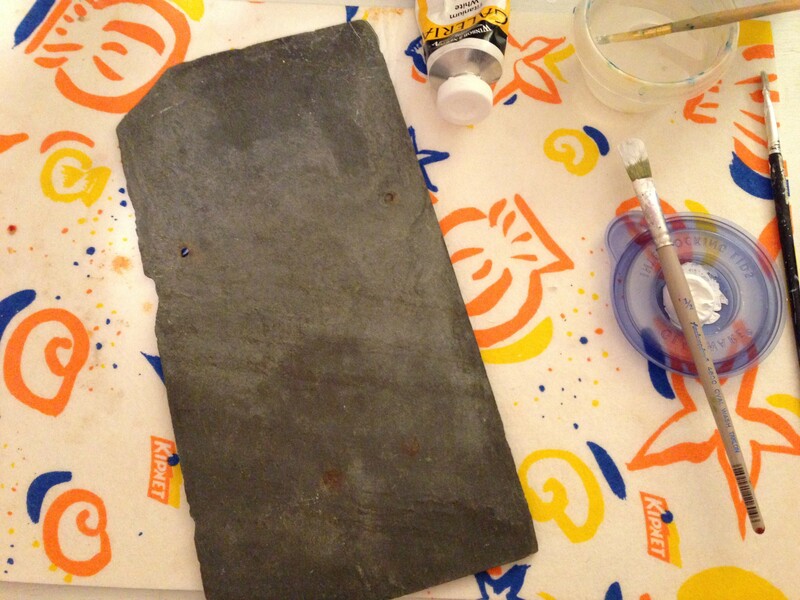 I have been schleping a few pieces of slate around for about 20 years. I did manage to use a few of them, but I have three remaining and intend to make them into finished pieces to sell at my Etsy shop. This will be my first project (ongoing with the baby blankets) to get completed before Christmas. Hopefully by the time you read this post I will have finished them. Project #2 – Ahhh, this one is rumbling around in my head and will be my biggest project/commitment yet. I don’t have all the details fleshed out yet, but what I’m thinking will involve twelve (one a month) largeish paintings to be put up for sale on Ebay. Hopefully in my next post I will have most of the details worked out and explain why I’m taking this on. Hi Lauri, I have some sites that I like to read. I will make a list for a blog post when I get back from vacation. Thanks for reading!